While the divided Tories meet in Birmingham to argue over who's going to take over from Theresa May and the Brexit morass of their own making, it's worth spending a little time considering some of the divisions that surfaced during Labour conference inside the Corbyn project. In particular, I'm talking about the tension between Corbynism and the trade unions - a relationship that has hitherto been productive and, effectively, saved Jeremy Corbyn's leadership when the Labour right made their move. However, friction between the two are inevitable and has recently been in evidence. Part of this stems from a generalised tension between the Labour Party and its union affiliates - the party has to construct a broad electoral alliance to appeal to as many voters as possible, and the audience of unions are ultimately their own members, which are of a much narrower range. On top of that, Corbynism as a movement and trade unions as institutions are different animals. Their political ontology are not the same. This then is the overall context in which we should understand moves to insert more trade union influence into how the party elects its leader, and why the reformed trigger ballot system won out at conference and open selections were defeated. Consider basic definitions. What is a trade union? It is an organisation of workers whose remit is to defend their interests, sometimes individual, sometimes collective, against one or many employers. For example, in the main the Communication Workers' Union sits across the table from Royal Mail (postal) and BT (telecoms). Unite on the other hand represents a larger number of workers in a huge variety of workplaces. Occasionally, when the balance is right, unions can go on the offensive and use their collective strength to exert pressure on employers to release more of the wealth they produced in the form of wages, less work time, and/or better conditions. As a general rule, unions are bureaucratic organisations too. They come with an administrative apparatus in which key positions are elected according to timetables, and on the basis of representative democracy. i.e. Few if any unions reserve recall rights, though getting by with a hostile executive or a no-confidence at conference would be practically impossible. As office holders the elected see the day-to-day operations of the union, taking on responsibilities of strategic priorities, resource allocation, staffing, etc. For elected officials and those employed by unions tend to be cushioned from the kinds of realities their members face. As a rule, they are generally better paid, enjoy better work conditions and perks, and tend toward the acquisition of bureaucratic, if not conservative habits of thought. These are pressures that bear down on people in these positions, and naturally these changes are conditioned by the state of class struggle at any given moment. In lean times for working class politics, like the 30 years between the end of the miners' strike and Jeremy Corbyn's election as Labour leader, this insulation can preserve the memory and experience of working class militancy. One characteristic of this period was the disproportionately large number of leftists, including the far left, who became elected officials and full-time union officers. Now politics is mixing it up again the relationship becomes more complex. As bureaucracies, the mass take over of the Labour Party gives them new opportunities to extend union influence - but poses a threat also. Unions tend to approach their influence in the party in the same pragmatic way. They look to maximise their influence via numbers on the NEC, motions to conference, sponsored MPs, sponsored party events, nominations of union personnel to job vacancies in the party, and relationships to party factions. See how Community and USDAW, for instance, chum up with Progress. How the T&G and then Unite in the West Midlands were the backbone of Labour First, and the CWU's affiliation to Momentum. This maximisation of organisational/general secretary influence is also an outgrowth of unions as sectional bodies. In the final analysis, workers have common interests. But their unions often don't. The immediate interests of one group of workers may come into conflict with others as employers try and play off one section of the workforce against another. For instance, different unions might organise different parts of the same employer. When I was a supermarket worker, the employer recognised the T&G (with whom I was a shop steward) and USDAW, which frustrated wage negotiations as one was used to undermine another. Likewise another place had three unions, one for each different section of workers, which made coordination among organised employees extremely difficult - not least because each group had bespoke negotiating arrangements. Also, unions can and do compete among themselves for recruits, up to and including scabby behaviour. At the end of it, a union is an organisation that wants to survive and thrive and these organisational interests have the tendency to win out over wider considerations. As organisations embroiled in the day-to-day guerrilla warfare of wage bargaining and preserving/improving working conditions, unions have to be pragmatic. Levering its collective strength and using soft power against an employer requires a continuous appreciation of tactics and strategy - at least if a union is doing its job properly. Therefore unions are habituated to piecemeal change, small victories (and reverses) and incremental improvement. This habit lends itself well to the to-ings and fro-ings of parliamentary democracy, and why so many trade unionists past too the passage from the shop floor to the floor of the Commons. This is also the material root of Labour's historic anti-intellectualism, and the short shrift revolutionary politics have received in this country. And then the old certainties dissolve and a new relationship with the party comes into play. Corbynism from the beginning had one foot in the unions, but the movement did not move through them. In its first phase of taking over the party, the people responding to Jeremy Corbyn's candidacy was composed of the politically atomised but socially networked. Minorities were old hands at the activism game, or people called back into politics, but the bulk were entirely new and had never been members of a political party before. They joined up as masses of individuals embedded in proliferating digital networks, which in turn recruited even more. These connections were vehicles of contact, affinity and affectivity. Corbynism in the unions initially assumed a similar character between existing leftists and a fed up officialdom. It proved string enough to bounce several general secretaries into endorsing Corbyn's candidacy, which in turn was helpful for winning over Corbyn-sceptical party members who take union support of candidacies seriously. Nevertheless, as a self-activating network, a spontaneous swarm that swamped the party and initially identified more with the ideas Corbyn represents than the rest of the labour movement apparatus, it was therefore different from the established, incremental and bureaucratic politics of the unions in and out of Labour. From this arises an important set of differences. The more methodical practice of the unions contrasts with the impatience of Corbynism. Their habituation to committee room compromises with other forces differs from the experience of Corbynism which, before party conference, is used to the direction of travel being its way thanks to the weight of the expanded membership. Hence the emphasis in Corbynism on members' rights and the role they should have in steering the party. This is where tension came out into the open in Liverpool. Unions wish to preserve their influence over the apparat and PLP, but having a truly sovereign membership with the subordination of the MPs and unions to it not only threatens years of painstaking influence-building, but offers a vision of what could happen in several unions if Corbynism spreads and its radicalisation deepens. While all unions might like to recruit hand over fist, they might be less keen if this was accompanied by demands for member-led democracy and curbs on the power of officialdom. In short, this tension is the inescapable result an encounter between two sets of progressive forces with different political ontologies, or modes of being. It's the bureaucratic hierarchy and representative democracy of the unions vs the multitudinous mass of Corbynism whose trajectory points toward more direct democracy. This is why the struggle for open selection and more party democracy is not about to go away. Can the tension be soothed? If things stand still, no. Therefore we have to ensure things do not stand still. Corbynism reached 13 million voters because it addressed and articulated a previously dispersed and unorganised set of grievances. On this, Corbynism and the unions are in fundamental agreement. They require more politicisation, and taking up to become bones of contention, of points that can be productive of even more struggle. But while there are plenty of such issues, the lynchpin is and will always be the workplace. This is the hinge of bourgeois power. Calling on unions to recruit more and organise more is to patronise the efforts of existing trade unionists who spend their time doing just that. However, here Corbynism has a role to play. In addition to legislation that makes effective trade unionism more difficult is the small, cultural matter of organised industrial action at work getting purged from the collective memory. Workers are inculcated by so many institutions as neoliberal subjects without social ties, which is reinforced by the nature of work, ranging from the precarious, temporary and the part-time to the individuating character of immaterial labour. 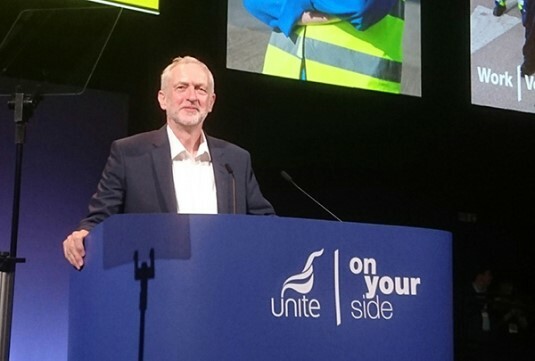 A Corbynism of the unions is important and necessary because a dose of deepened member sovereignty will enable unions to respond better to where most workers currently are and, hopefully, start drawing them in to the wider labour movement. Corbynism is important from the standpoint of world politics because it is the holy grail of many a abstruse debate about the death of class: it appeals to and forges together an array of positions which, if one is wedded to a liberal conception of identity politics, should not be possible. It reconciles seemingly exclusive constituencies by appealing to their common interests, doing so in alliance with "traditional" class politics and a hopeful vision of the future that encourages political imagination, if not experimentation. It has transformed the Labour Party, and has gone from there to reach out to a truly massive audience. For a movement just over three years old it is at the threshold of forming a government should the Tories fall, and it has transformed the traditional party of the working class utterly into something approaching where class politics now is. Unions as sectional organisations and oriented to mass workplaces will have a harder time achieving a similar take off, but it is possible. Democratising unions, making would-be members feel a living, relevant relationship to it, of offering themselves as networks of support and training as well as organs of resistance is the pathway to rejuvenation and overcoming tensions with the party and Corbynism in particular. Like it or not, Corbynism is the future, more direct democracy is the future, becoming more swarm-like is the future. Politics is changing, the character of class is changing. We have to make sure our way of organising collectively changes too so we can use our strength most effectively. And win. Overall, 85,190 votes were cast over 57 local authority (tier one and tier two) contests. All percentages are rounded to the nearest single decimal place. For comparison you can view Quarter Two's results here. **** Others this quarter consisted of Active for Plymouth (123), BNP (25), Democrats and Veterans (338), English Democrats (72), For Britain (63), Our West Lancashire (567), Yorkshire Party (47), Scottish Libertarian (13), Women's Equality Party (47 and 39), Nonsuch Residents (539), and Elvis Bus Pass (46). A boring but disappointing quarter for Labour,and also annoying to see the Independents surging again. If anything, you could argue this set of results almost returns to politics as usual. It makes no difference to the national polls, but at local election level at least perhaps polarisation is coming unstuck or never applied too much in the first place. Again, despite falling to bits the Tories out-organise everyone else, while the kippers continue to do poorly. No predictions for next quarter, though it past behaviour is any indicator of future behaviour the vote distributions will continue to be much the same. 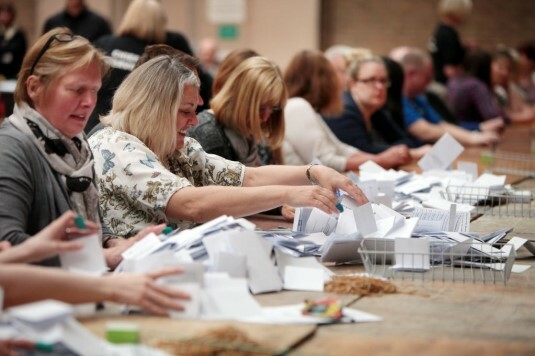 This month saw 31,923 votes cast over 19 local authority (tier one and tier two) contests. All percentages are rounded to the nearest single decimal place. Four council seats changed hands in total. For comparison with August's results, see here. What a month, eh? Not really. Barely any movement in terms of percentages. The Tories pick up two at Labour's expense, while dropping one to the indies who, in turn, grab another from some residents' association or another. The interest for me is at the lower and. UKIP's vote has remained at pathetic levels, despite the poll boost they got in July with the unveiling of the Chequers deal. That seems to suggest it's not filtering down to the local level at all, whereas - by way of contrast - LibDem election performance is not feeding up into the national polls. And the Greens are holding up quite nicely when they should really be squeezed by Labour. Nothing to add, except we'll be here same time next month to see what the crack is. Can Blairism Win Back the Labour Party? Have We Reached Peak Corbynism?